Published: Aug. 23, 2017 at 11:54 a.m. Updated: Aug. 23, 2017 at 12:22 p.m.
FLOWERY BRANCH, Ga. -- If there's any positive that the Atlanta Falcons can take away from their loss in Super Bowl LI, it's that they have plenty of reasons to believe they can return to the NFL's biggest game. The Falcons may have blown a 25-point lead against New England in February, but they also showed the world how deeply talented they were. Most importantly, the defense that helped them win the NFC Championship Game was just starting to come into its own. This fall should be the time when that unit advances to another level. The same defense that defined itself with youth and athleticism now has more veteran experience and depth. There's a new coordinator -- former defensive backs coach Marquand Manuel received that promotion -- but the principles won't change at all. The Falcons rebuilt their defense with an emphasis on speed and quickness. The only difference these days is that the players have a better idea of how to capitalize on those assets. 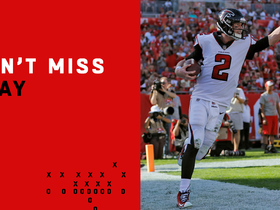 That Super Bowl loss taught the Falcons a thing or two about what happens when you don't finish. Their fast start in that game also educated them on what this defense can be when it is clicking. "It definitely pushed everybody for this offseason," middle linebacker Deion Jones said of that defeat. "When you're striving for something, there's always going to be a roadblock. You just have to keep your head up and get back to it, regardless of how far or close you are or how much you fell short. You just have to go back to work." The Falcons don't have to do much to pick up where they left off. Even though they ranked 27th in the NFL in points allowed (27.4 per game), they only gave up an average of 19.3 points in their final six games leading up to the Super Bowl. Much of that success had to do with head coach Dan Quinn taking over defensive play-calling duties in the second half of the season. It also resulted from several first- and second-year players growing up in a hurry. The core of that unit returns intact, with Jones, Pro Bowl defensive end Vic Beasley and safety Keanu Neal as the headliners. 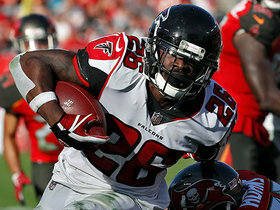 Atlanta also returns its best cornerback in Desmond Trufant (who only played nine games after sustaining a torn pectoral) and bolstered its defensive line through the draft (defensive end Takkarist McKinley was Atlanta's first-round pick) and free agency (with the signings of defensive tackle Dontari Poe and defensive end Jack Crawford). The goal is for Atlanta to be more disruptive up front and more dynamic on the back end. One thing that already is apparent is that his bunch won't lack for confidence. The Falcons have to improve in more areas -- they also ranked 25th in the league in yards allowed (371.2) -- but the expectations are high. "I want to see the overall consistency week in and week out," said Manuel. "The will to compete for a true 60-minute game. The will to sacrifice and reload every week. I've done something different in that I've let them set our goals. Usually, it's the coaches saying, 'We want to accomplish X, Y and Z.' No. This is their team. We are player-led and that's one of the biggest things they talked about." Manuel wouldn't go into the full list of his players' goals but he did acknowledge the most important: What's going to be their collective intent? This wasn't just a question about the overall season, either. Manuel said those players were talking about what their intentions will be hourly, daily and weekly. 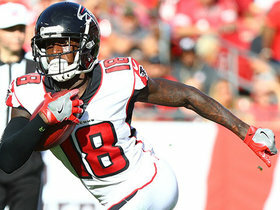 That alone speaks to how different this group will be from last year, that they're fully grasping their potential at a time that is critical to the Falcons remaining in championship contention. All Atlanta has to do is look within its own division to see what can happen to a Super Bowl loser one season after a devastating defeat on football's biggest stage. The Carolina Panthers fell from grace despite having plenty of talent returning from a team that went 15-1 in 2015. The Falcons still have the offensive firepower to frighten teams. What will make them scarier is if their defense can continue to surprise as it did last season. 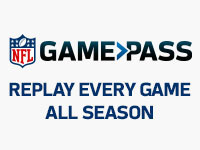 There were once whispers around the NFL that Beasley might be a bust -- and then he erupted for 15.5 sacks (to lead the league) in his second year. Few people knew much about Jones and Neal until they began making plays all over the field as rookies. As Neal said, "The biggest thing for me is the speed of the game. Just having an understanding of the defense and knowing the finer details of it. Last year, I was learning as the season went on. I'm still learning but I have a better understanding of it. That's a really good feeling because now I can move like I want to and play instinctively." That should be largely true of the entire Falcons defense. It's a unit that has been molded straight from the blueprint Quinn learned during his time with the Seattle Seahawks, a team that built a championship squad led by its own athletic, attacking defense. The consensus upon Quinn's arrival was that it might take a few years to find the necessary pieces to play that style in Atlanta. The fact is that few people outside the organization could imagine a scenario where so many different players would have a chance to mature so quickly. This year the Falcons will be relying on at least six starters who are going into their second or third seasons. That now seems like a positive. "We're all growing together and that's been the beauty of it," Jones said. "We've all been students of the game together, and we've been trying to get one percent better every day. ... I think that we'll be better in how we start and finish. There's a lot of focus in keeping our standard throughout the game. We're just trying to set it off and finish." That, of course, brings us back to the last game of the Falcons 2016 season. At the time of that Super Bowl defeat, they talked about being humbled, devastated and committed to learning from such a demoralizing setback. They were saying the same things that every second-place team says in such moments. The only difference was the heartbreaking manner in which they wound up in that position. 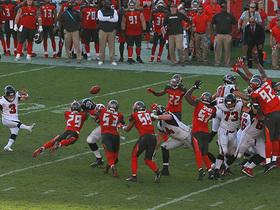 What's encouraging about the Falcons today is that they realize the unintended good that came out of that. For three quarters, they were faster, more athletic and noticeably better than a franchise that has won five Super Bowls over the last 16 years. That didn't happen solely because the Falcons have Matt Ryan, Julio Jones and a powerhouse offense. It also happened because this team has a defense that is learning how to inflict its own damage on the NFL.